After five years of square-shaped tyranny, Instagram will finally allow users to post portrait and landscape photos and videos. The Facebook (FB)-owned photo-sharing tool announced the change Thursday morning. To start posting photos in their original shapes, users must update their iOS and Android Instagram apps to version 7.5. When you select an image or video, a new button will appear in the bottom left corner. Tap to toggle between square and not-square. For some Instagram photographers, this update is great news. No more cropping out feet, lesser bridesmaids, tops of giraffes or scenic backgrounds. For others who found the constraint inspiring, it might take some getting used to. "Square format has been and always will be part of who we are," said the company in a blog post. "That said, the visual story you're trying to tell should always come first, and we want to make it simple and fun for you to share moments just the way you want to." Instagram's square crop and faded filters were originally designed to mimic medium-format film cameras. You could work around the restrictions and post rectangle photos using third-party apps. But you had to shrink them down and pad them with negative space. That hasn't stopped people from shunning the square. 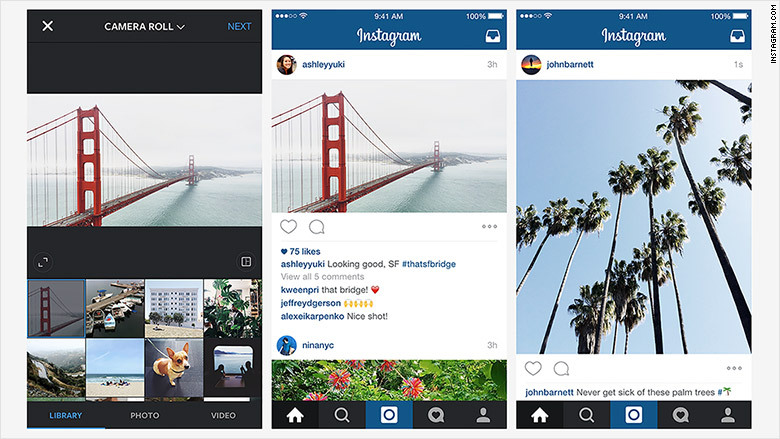 According to Instagram, one in five posts aren't in the square format. If the first big post is any indication, advertising dollars may have played a part in the decision. The official Star Wars Instagram account posted a widescreen video on Thursday morning. The clip has already receive more than 80,000 likes. Videos will now have the same filters as photos, and you can adjust the intensity as you would with a still image. If you don't see the new features right away, check back later. They're rolling out throughout the day.